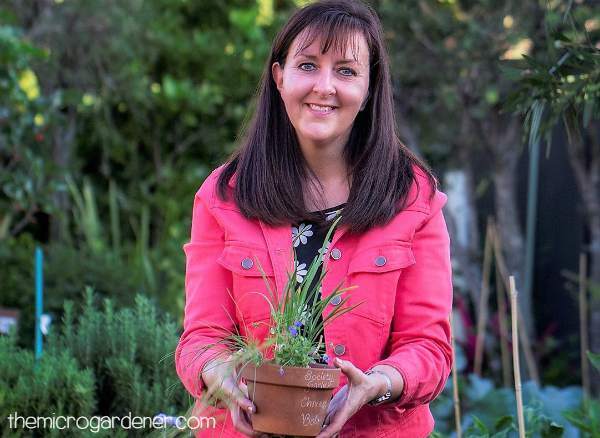 For years, I’ve grown and used herbs on a daily basis – mostly picked fresh from my garden. When I started out, I just bought a bunch of parsley or chives but often ended up wasting half of them. I didn’t give any thought as to whether they were organic or not. They were just needed for a recipe! I thought only of flavour and using them as fresh ingredients, or sometimes dried herbs in a meal. When I first left home, I had a few herb pots tucked on sunny window sills indoors and plenty of dried herbs in the pantry. Moving 16 times over the years has meant I am used to very portable gardens and starting over! I was never very conscious of what soil they were grown in. 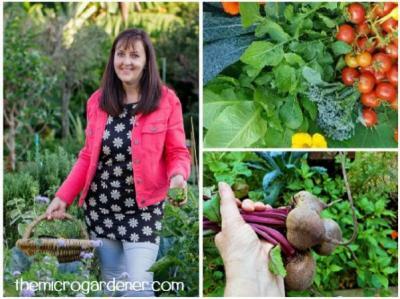 Often I created my own ‘dried herbs’ when I didn’t know how to care for my plants properly! Gradually, I expanded the flavours and uses of herbs I cooked with – and those I grew. It didn’t happen overnight. It was a journey over time. Initially, I just kept to a few basics like parsley, chives and mint. At least I was growing something. I’ve always loved cooking and no doubt that has something to do with the fact my husband has stuck around for 26 years! He is my guinea pig when it comes to playing with fresh ingredients in the kitchen. I’ve used herbs of all kinds to flavour meals and most of us do. Growing up, I was inspired by my mother (a remedial therapist who loved using essential oils and natural remedies) to use quite a few for their medicinal properties. Lavender and aloe vera are two of my favourites, but there are many more. Whenever I was sick or hurt, she was there with some natural solution or herb to soothe and heal. From a young age, I appreciated that plants were more than just green things in the garden! They were used in different ways. However, my interest in the preventative healing properties of many herbs began with urgency after I got cancer in 2004. I was highly motivated to take a proactive role in building my immune system to regain my health and prevent disease in the future. Nothing like a health crisis to make you fully appreciate being well. I began to realise I didn’t have to feel disempowered about my health. I could actually take control over what I ate. 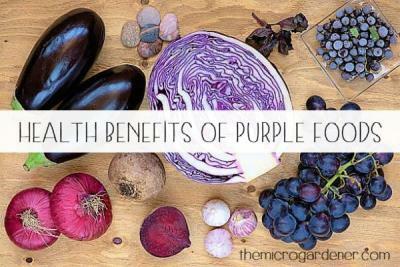 By learning about the healing properties of many fresh foods and introducing them into my diet, I regained new energy. Health issues disappeared. Literally. Thankfully herbs have played a vital role in restoring vibrant health. I treated my health like a project. I threw myself deeply into educating myself about how to use herbs (and other foods) to nourish, support, heal, soothe and feed my body – and my family’s. Since then, I’ve been growing and using herbs daily for health and wellbeing. Perhaps you too, have had a health scare. Or want to avoid one. Or a repeat of something that happened in the past. Whatever, your situation, I hope my story and what I’ve learned will help you – or someone you know, too. 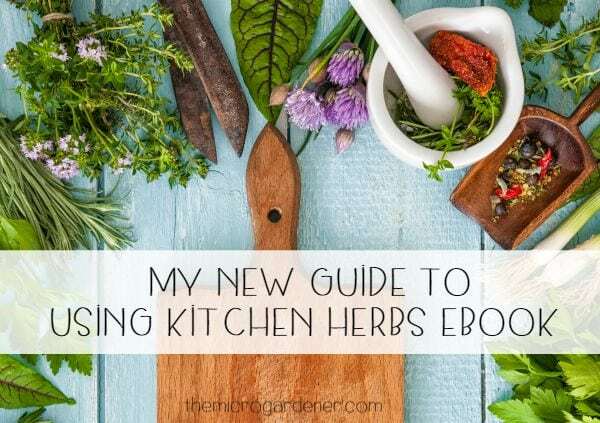 So that is what led me on this journey to write ‘Guide to Using Kitchen Herbs for Health – How to Grow, Eat & Use Herbs Daily.” I wanted to make it easy for other people to walk this journey. Gradually introducing everyday kitchen herbs into meals and growing at least a few, for their medicinal properties. When I was getting well and trying to live a healthier life, I didn’t have the time, energy or skills to know which herbs to use for their healing benefits. I didn’t want to have to find some wild herbs I’d never heard of to make concoctions! I’d been interested in essential oils because I had grown up with them. Kitchen herbs that would do double-duty if you like, for spicing up my meals, while also aiding digestion or healing a minor ailment. I couldn’t however, find a book that shared how to do this. They were either digging deep into medicinal herbs (many of which I would never grow) or on culinary herbs and just how to cook with them. I wanted to know how to do both and learn more about the nutritional value of my chives, parsley and mint. How the herbs were grown, was also going to impact my health. I knew soil health (or lack of it) was going to determine whether my herbs thrived, or just survived. However, I didn’t want to just survive. I wanted to have incredible health and energy! 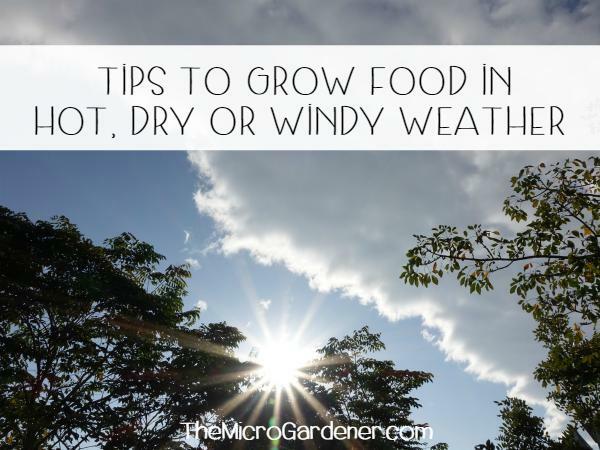 I have learned how to help my herbs thrive in minerally-rich soil, so they contain maximum nutrition. Because all their needs are met nutritionally, they don’t suffer from pest or disease attack. So healthy herbs provide my body with optimum nutrients as a result. Just like plants, if our bodies have the balance of nutrients, we can ward off illness too. My herbs and plants have optimum health so when I harvest and eat them, they are remineralising and boosting my immune system. If this sounds like something you’d like to learn more about, I invite you to read on. No matter how small a space you have, there’s always room for a few potted herbs! Herbs have been used for health, flavour and healing for thousands of years. However, instead of being self-reliant, we’re taught to buy our herbs at the supermarket, instead of growing them at home. 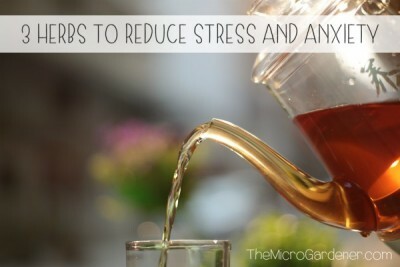 Or rush to the chemist or medical centre, instead of using herbs for minor ailments. Of course, that’s a personal choice. Imagine instead though, you’re feeling stressed or tired, lacking in energy or a bit down. How would you feel if you knew which herb to pick at home, to make your own stress-relieving, uplifting, or sleep inducing tea? Or sprinkle on a meal. What if you knew which kitchen herbs to use in meals, that could also provide your body with specific healing benefits? It’s so empowering to pick a few leaves to help aid digestion, relieve skin problems, a headache, or increase energy. I love living this way and that’s why I’m excited to share what I’ve learned with you! Want a taste of some delicious goodness from my book? Click Here to learn more and VIEW A FREE SAMPLE – yes of course, you can try before you buy! Here are a few snippets to whet your appetite. Fresh basil contains Vitamins A, C and K and many phytonutrients essential for health. Like all herbs, basil contains digestive enzymes. It is an excellent home pharmacy medicinal herb to grow. It contains compounds with anti-inflammatory, antibacterial, antioxidant, antimicrobial properties as well as chemopreventive and radioprotective effects. 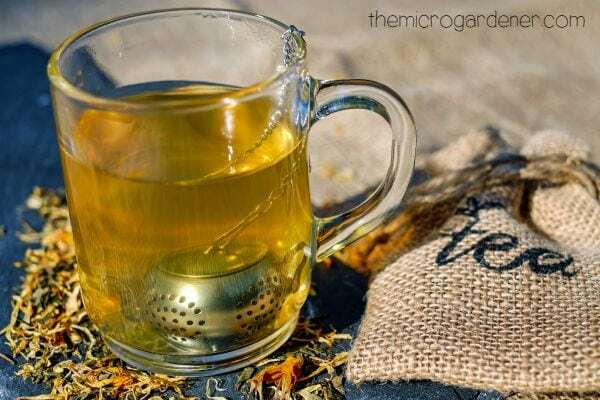 Brew up a few fresh basil leaves or about 1 teaspoon of dried leaves as a herbal tea to aid digestion, calm nerves, reduce tension and stress. You can also add your other favourite herbs. Crush a basil leaf and bandage onto a bite or sting. 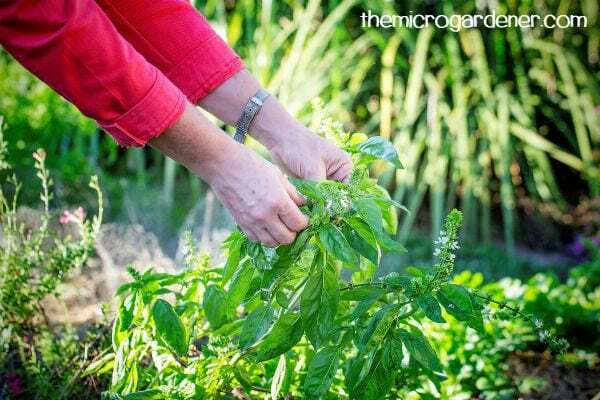 This may help to draw out the poison and reduce the pain – a handy remedy for any gardener! At the onset of a headache, a crushed leaf rubbed over the temples may help relieve symptoms. In my book, I dive deep into the many uses for basils in your kitchen and garden. I even share an easy recipe for making Basil Stem Tea. Yes, it has its unique medicinal properties too. Research reveals the compounds in basil stems help relieve muscle spasms in the stomach and intestines, ease indigestion and wind! So, no more wasting basil stems or composting them. 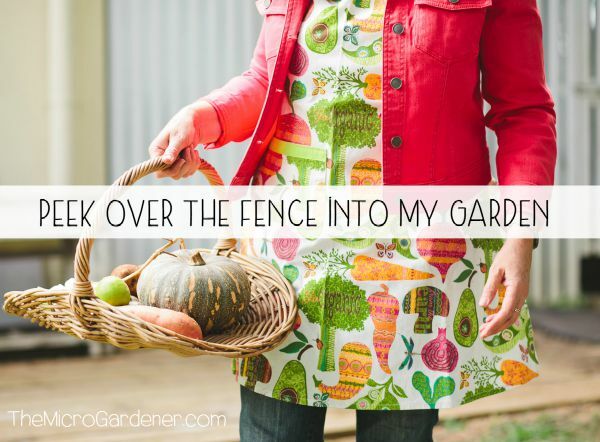 You’ll learn how to put them to good use as well as the leaves. One of the most popular kitchen herbs, they are excellent for digestion. 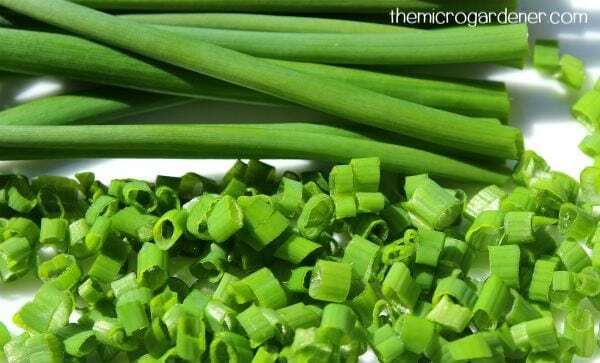 So snipping a few chives onto a meal as a garnish will help make fatty foods more digestible. If you eat meat or high fat foods, this herb can help you digest the nutrients. Chives are a good source of iron, vitamins A, B and C and have a mild onion flavour. Chives are an excellent source of vitamin K that helps strengthen bones and brain health, as well as calcium, magnesium, potassium, copper, manganese and zinc. So much goodness in just a couple of teaspoons! In clinical studies, chives have demonstrated their ability to inhibit salmonella in certain foods, lower high blood pressure, and reduce the risk of stomach, gastric, lung, mouth and esophageal cancers. Pretty impressive hey? In my book, you’ll learn how I use chives in the garden, easy ways to grow, harvest and store them and more about their health properties. One of the essential kitchen herbs to have in your Home Pharmacy Garden. OK, and here’s another tip from the kitchen section to save money on seasonings while enjoying the health benefits of fresh and dried herbs. All dried herbs are so packed with flavour that it’s not even necessary to add salt. You can combine your favourite dried herbs together and make a salt free herb sprinkle. I share some of my favourite combinations to boost flavour in your meals. I’d love you to take a look at my new book. You can read a sample and check out if you think it will help you, or someone you know. I’ve just released it as a digital version so you can read it in any e-Reader, Kindle or as a PDF. Interested in using Herbs and Essential Oils? To launch my new eBook, I’ve teamed up with 33 other herb and essential oils experts to share it as part of a discounted package. If you are interested in using Herbs and Essential Oils to keep your family healthy, I invite you to check out the bundle to see if it’s right for you. 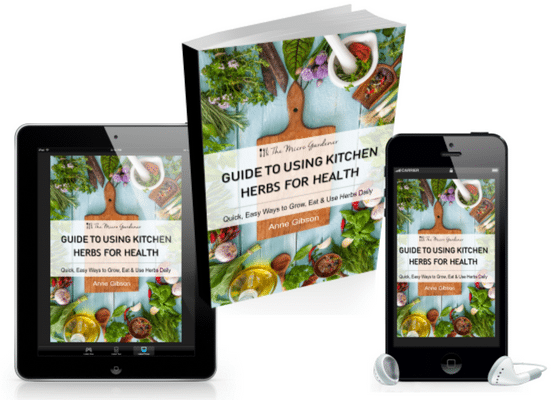 You get 34 eBooks, eCourses, printables, and membership sites designed to help you use easy and effective natural remedies, know which herbs to use and WHY they work, cook with herbs, create inexpensive beauty products without harmful ingredients + much more. $567.48 Value for $29.97, but just for 6 days. CLICK HERE for more details. Visit my article library for more herb articles and tips. Some links within this article are affiliate links. I only recommend products or services I use personally or believe will add value to my readers. If you purchase a product via an affiliate link, I will earn a small commission. No additional cost to you. It’s a way you can support my site, so it’s a win-win for both of us. You directly support my ability to continue bringing you original, inspiring and educational content to help benefit your health. Thanks! Please read my Disclosure Statement for more details.